Winter evenings can be a spectacular time to get outside. The crisp air and the white snow blanketing the ground combine to add a new light to our winter city that you don’t get during long summer days. That magical lighting (and excuse to share warmth) helps add just the right ambiance to an evening out when you’re holding hands. If you need a little inspiration to get outside on our winter evenings, here are some of our favourite spots and activities that anyone can warm up to. A small strip of 100 Ave just South of Jasper Avenue, the Promenade has been a quiet favourite for many Edmontonians for years. Lined with benches and muted lighting, this is a fantastic place to head out on a walk for two. With Jasper Avenue close by there are plenty of options for picking up a hot drink along the way, or to stop at for a warmer after your walk. The Promenade is especially beautiful on a snowy night! One of the newest additions to our river valley, the Funicular provides new access to views and trails both high & low. From the Promontory up top, all along to the Fredrick G. Todd Lookout, you’ll have plenty of time to enjoy great views of the river valley below and the skylines on both sides of the river. Perfect for some warmth-sharing time. Start near the south end of the High Level Bridge, and head east for great vistas of downtown and the river valley all the way to 99 street. There are plenty of spots along the way to enjoy the views together, or even to explore a little further into the river valley if you want to tackle some stairs. From 99 street you can re-trace your steps back down the drive or make it a loop by walking up to Whyte Avenue and stopping for a beverage of choice. Coffee, tea, craft beer and more – there’s a lot to choose from! 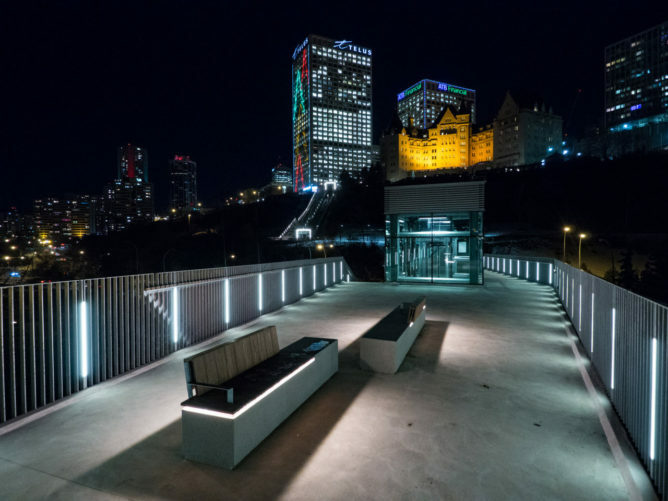 Bonus: If you’re not ready to call it a night, add a stroll out along the High Level bridge over to Constable Ezio Faraone Park just on the other side. If you need something a little more ambitious than the neighbourhood rink, head out to the Victoria Park IceWay. Beautifully lit, and with warming huts on site, it has quickly become an iconic spot in the city to go for a skate. In fact, this entire area of our downtown is worth a walk. From the Neon signs to the shops of 104 St as you approach Jasper Avenue, this strip provides great views of this outdoor museum and some of Edmonton’s older architecture. Enjoy local shops while you’re there, and get a great view of Roger’s Place and the activity surrounding it as our downtown continues to grow skyward. Who says you need daylight to cross-country ski? 9 city parks have groomed trails, many of them with great night-time WinterCity views! No matter what time of year, the Alberta legislature provides a beautiful backdrop to an evening walk. During the winter months, bring along your skates and enjoy the rink on the South grounds. There aren’t as many amenities here, so we suggest bringing along a hot mug of your favourite beverage. We don’t have long nights, we have an early-access pass to awesome night skies. You’ll be able to see more stars by heading to some of our less-lit river valley trails like Whitemud Creek, Mill Creek, Wolf Willow, or Hermitage Park. If you want to step outside the city, look for great evening hikes at Cooking Lake-Blackfoot, Elk Island Park, or the close-by Bunchberry Meadows. When heading to the trails after dark, make sure you have bring along a headlamp, a trail map, a charged cell phone, and be wildlife aware! Winter Patios are sprouting! Check out some of our favourites, and be sure to let us know if you find a favourite new spot to sit and sip in the city! What are your favourite ways to get out after dark? 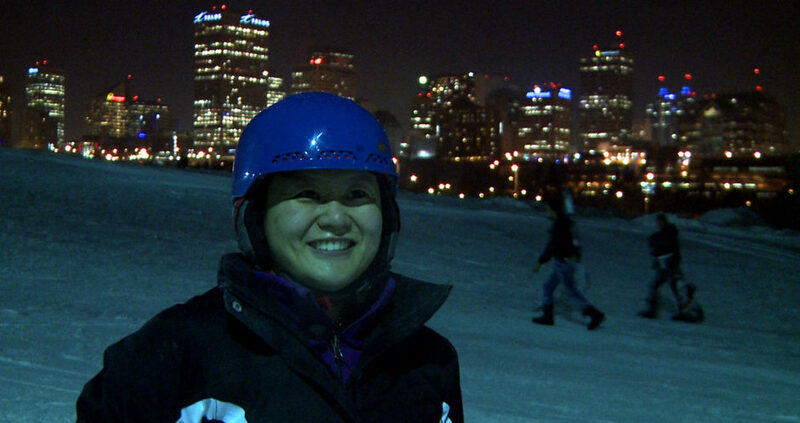 Share your tips with us at @WinterCityYEG! 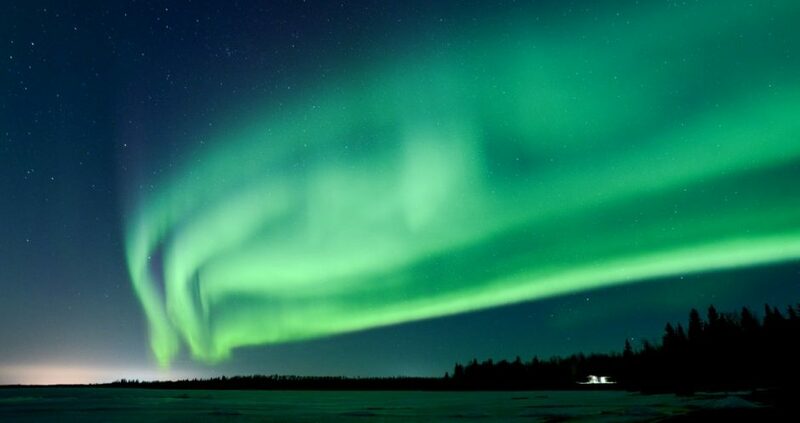 If you’re looking for specific events like the Edmonton Ice Castle, Candy Cane Lane, or one of Edmonton’s other 70+ winter events and festivals, make sure you check out our events page for what’s coming up!